1. 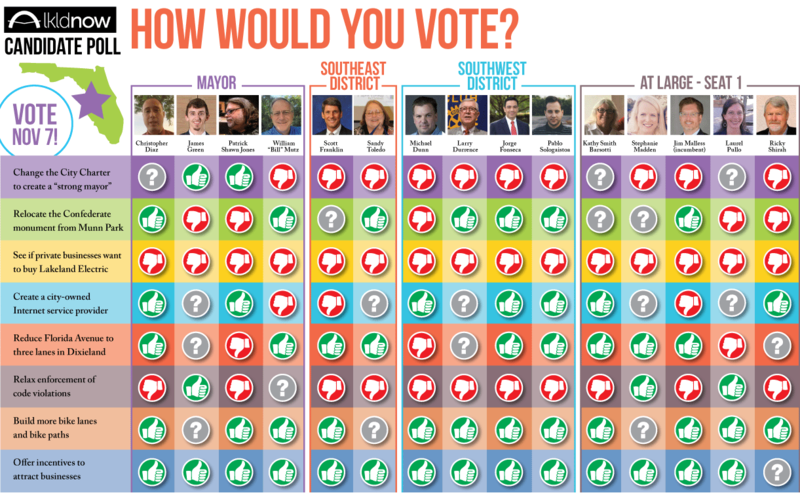 Change the City Charter to create a “strong mayor”? Undecided. It’s not indecision. I feel strongly that there is a conflict of interest if a mayoral candidate is swaying votes on this issue. 2. Relocate the Confederate monument from Munn Park? Yes. I would be for a relocation. The Daughters of the Confederacy (those who commissioned the statue, and a likely opponent of the idea) have publicly said they support this move as well. 3. See if private businesses want to buy Lakeland Electric? No. We learned after Hurricane Irma what kind of service we receive compared to private companies. This is a large source of revenue for the city and we as consumers will lose the ability to have effective communication with those that run our electric company. 4. Create a city-owned Internet service provider? Yes. This could serve as a signal that Lakeland is ready to embrace the future. The majority of the groundwork is already completed. We as consumers can receive a better product at a reduced cost. 5. Reduce Florida Avenue to three lanes in Dixieland? Yes. Public safety and business development are two key points in my campaign. The research shows a lane reduction will reduce traffic accidents and increase business traffic in the Dixieland area. 6. Relax enforcement of code violations? 7. Build more bike lanes and bike paths? Yes. This can go hand in hand with the Dixieland lane reduction. I would be more in favor of a sidewalk bike path rather than additional bike lanes in the road. 8. Offer incentives to attract businesses? Yes. Business growth, both small and large, is a necessity for our future. Our median income is well below the Florida median and we need to do what we can so that Lakeland families can provide for their children. No. We should look at adding something too the park, but not take away the monument. Undecided. Balancing out the need for greater revenue and not negatively impacting the free market is important here. Undecided. Something should be done, however, more research and public engagement should be accomplished first. Yes. I believe in healthy discussions that increase understanding as we hear the hearts of others. The monument reflects history and honors those who gave their lives to defend their cause. Giving your life to defend your country should be honored. Yet, the monument reminds other members of our community of the pain of defending that very same cause. A public space should celebrate the best aspect of our city – all its people. If we choose to relocate the monument, I’d also be in favor of adding plaques discussing that story and why we chose to do so for the greater good. The best opportunity we have to unify Lakeland is to honor all. No. The city could lose hundreds of millions of dollars doing so alone. Technology changes too fast, costs are too great, and the competition is too large for us to consider doing this UNLESS we had a private partner that could absorb those risks. This is why the RFP to identify a potential third ISP partner is a next-step imperative. Yes. I am in favor of allowing DOT to perform the study and then see what we learn in the process. Undecided. Code violations need to be universally enforced and I am undecided only in regards to making certain, along with stakeholders, that all the applied criterion are optimal to-date. I simply need to learn more on this topic from the perspectives of both sides. Yes. Incentives are only paid if promised formula criteria are attained. We compete with every other major market against the incentives they offer. We are in control of the standards we want to set, the businesses we want to attract, and IF we want to extend those offers in the first place. We determine whether or not the company(ies) we are courting are desirable for our city. Undecided. Personally not in favor, but interested to hear community input at the Commission Town Hall and NAACP community meeting. No. I’m in favor of the city enhancing its broadband capability, but not as a city-owned utility. Yes. *If the traffic studies show we can redirect traffic so as to not create unacceptable backups or issues in adjacent neighborhoods. No. If the Code needs changing we should. I don’t believe in having rules we knowingly ignore. Yes. As part of an overall master plan for community transportation. Not simply done in a vacuum. Yes. For targeted industries and businesses that bring high wages and desired skills. No. I agree with Ashley Troutman in his proposal. If a decision cannot be made about the monument’s future, the issue should be placed on a future ballot for the people of Lakeland to decide. No. We should grow Lakeland Electric as an enterprise fund. Yes. We should grow this service slowly and cautiously. We need to know the exact whereabouts of the existing 330 miles of fiber optic line. There is demand for this service around the fastly growing Lakeland Regional Airport area and I believe we already have fiber optic lines at the airport, so why not use them? No. I do not think you should do this before addressing other road concerns first. I believe there should be a realignment of the George Jenkins, MLK and Kathleen interchange. With this we would be able to siphon some traffic off the north end of Florida Avenue before it enters the downtown area. We also need to figure out a way to efficiently move traffic east and west just south of the Dixieland area. A widening of the railroad overpass at Sloan Avenue would also go a long way in diverting traffic off of Florida Avenue. No. We actually should have stronger enforcement of repeat offenders which are usually the absentee landlord type scenarios. We should be easier on the elderly who often cannot keep up with their property. I have been on the Code Enforcement Board for the past 3 years so I have first hand knowledge of this issue. Yes. We should make our town more bikeable and walkable. We need bicycle detectable sensors to activate traffic lights at intersections. This should be part of the discussion with the Dixieland road issue. Yes. Incentives and grants have been instrumental in the improvements we have seen from Dixieland all the way through the Midtown. No. Our current government with an elected mayor and six commissioners provides geographic, ethnic and gender diversity,and public input in public meetings. The proposed charter amendment would concentrate power in one person who can make decisions in private without commission or citizens’ input. Yes, rather than allow that to divide our community at a time when we must learn from history and build a city which provides more equitable opportunity for all. An alternative is to add additional monuments to tell the comprehensive story of our history and the effort to provide all the right to life, liberty and the pursuit of happiness. No. Lakeland Electric belongs to Lakeland citizens and produces electricity at rates comparable to investor-owned utilities, and it provides a continuing source of revenue which keeps property taxes and fees lower than most comparable cities. Undecided. Without private partners or long-term contracts from business and industry customers to provide predictable revenue to repay the bonds necessary to cover the multimillion-dollar cost, it is too risky. But I approve the concept. Undecided. FDOT says the current lanes are too narrow and reported 174 accidents with 132 injuries. Unsafe conditions prevent expansion of businesses in Dixieland; however, existing neighborhoods must be protected from having excessive traffic diverted to residential streets. Do the test recommended by FDOT to determine if we can help Dixieland without hurting neighborhoods. No. Proper code enforcement keeps our city neighborhoods more attractive, safer, and protects the property rights of citizens who maintain their property. Code Board members need better training, and the code itself needs updating. Yes. Lakeland needs some existing roads improved and additional roads constructed to relieve congestion, and bike lanes should be included at the time of improvements when possible. Yes, but selectively when it is possible to gain jobs with wages considerably higher than existing averages and only when there is a clear return on investment that benefits our citizens. Incentives should include “clawback” provisions in case a business does not fulfill commitments. Tax incentives shift more tax burden to citizens unless the businesses produce public revenues and benefits. Yes. With private funds “only”. No. In my opinion, changing the structure of our city government is not as important as making changes to our current system. For example, I strongly favor having single-member voting districts and the power to fire department heads who perform poorly. Yes. The statue should be relocated to the Roselawn Cemetery, where several Confederate soldiers are buried. From an economic development perspective, a Confederate statue at the heart of our city and downtown does not make the best use of our city’s property and does not reflect Lakeland’s values. Yes. I would like to see us begin with a market test to see if our city can support a city owned ISP. If the market test is successful, then we should pursue expanding it to the rest of our city. Yes. I am very much in favor of the proposed South Florida Avenue road diet. At the very minimum, I support the proposed year-long test. I got the opportunity to go to Orlando and study the effects their road diet had on one of their main streets. The result? It spurred $600 million in developments, reduced car accidents by over 40%, drive-through traffic in the surrounding communities stayed the same, and increased traffic wait times were limited to 54 seconds during rush hour times. I think a 54-second traffic-wait increase during rush hour times is good tradeoff for safer streets alone. No. I am strongly in favor of deregulating city codes, streamlining and standardizing processes within the community development department. I am also in favor of increasing interdepartmental communication. However, I am not in favor of relaxing the enforcement of current laws. Doing so would lead to the slippery slope of subjective law enforcement based on favoritism and relationships. Ultimately, this will result in moral turpitude. Yes. Absolutely. We should be a city that is focused on supporting alternative modes of transportation – from biking to public transportation methods. Supporting alternative forms of transportation will not only bring us closer as a community, but it will also make us environmentally friendly. Yes. In order to remain competitive, we must provide tax incentives for both incoming and new businesses. I would like to see incentives given to organizations that employ specifically within the Northwest District and raise the median income. Undecided. I will fully support whatever the voters decide. Undecided. I look forward to hearing the town hall meeting. I, personally, would like the park to return as it was in the 80’s with the large people-centric fountain and the addition of a bandshell suitable for music and play performances. Shakespeare in the Park? Puppet shows? Yes, please. No. Why would we want to sell our Golden Goose? It’s our only insurance, right now, of the next economic downturn. Yes. Absolutely. Level the playing field for ALL residents. Create a learned base. Put the ‘progressive’ back in our city mantra. Yes. It is the only way for Dixieland to survive and thrive. There are also multiple safety elements involved. No. Streamline the process. See beyond black and white. Yes. As we become a more multi-faceted society, yes. Yes. With criteria. What is it they are bringing to the city? Does it improve our city? Will there be benefits (jobs) for our citizens? Will it be ‘better than’ minimum wage jobs? Undecided. I would like to erect more artwork in our city square, to continue our story and celebrate our diversity. Undecided. I would like to proceed with the RFI process, and get all of our options for deploying a next-gen network on the table. Abundant, affordable bandwidth is a necessity, but I want to learn from the data compiled from other cities, check out P3 possibilities, and see if emerging technology can save us money on that last-mile cost. Yes. For safety and revitalization! Yes. And make it more customer friendly. Undecided. I’d like to look at our budget, along with the projects we have in the pipeline before making that decision. Yes. I am all about higher wage jobs! Our growing number of college students and technically trained workers want to be able to develop their careers right here in Lakeland. I would love to pivot towards research and tech to employ our STEM-trained workforce at Florida Poly. No. The proposed charter change was not balanced enough for me. Yes. Let’s find a new place for it. No. I think that starting a new internet company to compete against private industry is very risky. I will support a test area. Yes. All for it. Helps both Dixieland and downtown. Helps to open west of Florida to new downtown development. No. We need to protect our neighborhoods. No. Put up a placard to commemorate all of our fallen soldiers and veterans. No. Put detour roads that would be needed in first. That may just resolve the problems on its own. Yes. Get rid of biased codes. Undecided. For better paying jobs. But for hundreds.